Here's a dichotomy from the learning sciences. Deal with it. Somebody did a quantitative study X and now wants to do Y. Before you think Y is a good idea, what do you have to know about X? How would you help math teachers learn about X given conditions Y? I hadn't quite anticipated Question 1 so there was some background work to do before I could address certain details. Thankfully, I was pretty well prepared to structure my argument, and it was on this question that I did my best writing. While I'd had dreams of finishing a couple questions before the end of the weekend, my actual pace was slower than that. A lot slower. By the end of Friday, I'd written about a paragraph, and by the end of Saturday, I'd written about a page. Fortunately, that was the foothold I needed to have the rest of the 9-page paper finished on Sunday. Next I answered Question 2. In some ways this was the question that worried me the most, but my studying definitely helped. Still, my writing was slow and it wasn't really until late Wednesday when I had this question finished. When you have three questions to answer in seven days, taking six days to answer the first two questions is less than ideal. That left me to answer Question 3 in a bit of a writing sprint starting in the wee hours of Thursday morning, breaking to attend and teach class Thursday afternoon and evening, and then writing until 7am Friday morning to finish. Question 3 was my advisor's question and the one for which I was most prepared; in fact, a couple pages was largely a rehash of some of some things I'd blogged about in the past. Having that for a strong start certainly helped the rest of the paper take shape rather quickly. It was a relief to reach the end of comps week, but I couldn't get too much rest because I had put off a number of things (okay, almost everything) during comps and in the weeks leading up to comps. Professors and fellow students are very understanding about it, which is great, but I wasn't entirely comfortable using comps as an excuse to not do much else during that time. In the past two weeks (including some of every day of my fall break), I've been catching up with the class I take, the class I teach, and the research project I'm on. I haven't been blogging and my social media activity has been pretty minimal during this time, but I'm starting to feel caught up. The last hurdle to clear is the oral examination, scheduled for this Tuesday morning. I'm not too concerned about it, and thankfully, the message from my comps committee has been not to worry. But between now and then I will be going back over my responses, double-checking the literature I cited, and reading a few new things I uncovered during the comps process. My advisor hinted at some things he wants to talk about and I'll be sure to prepare for those things, too. By 9 am Friday, November 2nd, my advisor will email me my three comprehensive exam questions. I have exactly a week to answer them. He says I'm prepared, and I appreciate his confidence in me. I think I'm reasonably prepared, too, and I greatly appreciate that among my numerous anxieties, test-taking isn't one of them. Far from it, in fact. See, I'm one of those mystical kids that policymakers have in mind when they come up with laws like No Child Left Behind. I'm the one who actually likes taking tests and fools himself into thinking they're just a harmless yet useful snapshot of broad academic knowledge and skill. Give me a #2 pencil and bubbles to fill in and I'll happily work for hours. 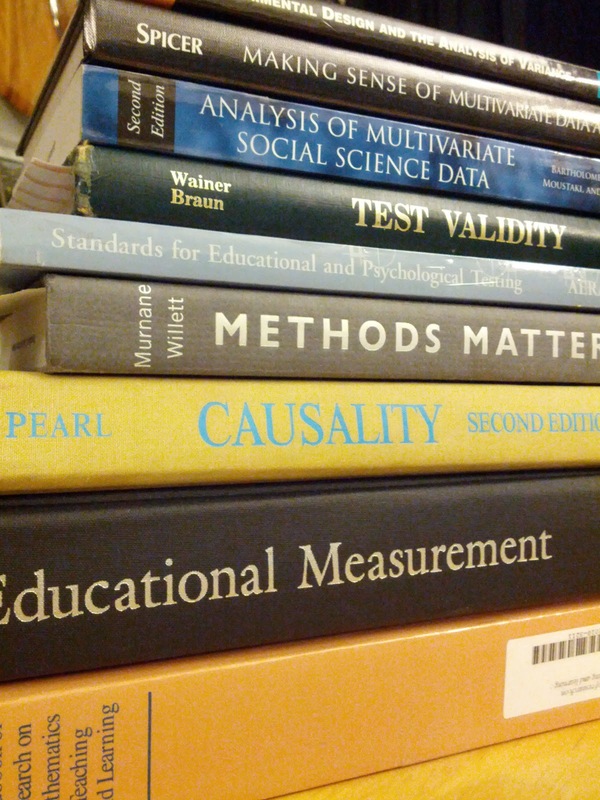 I think my personal library will have most of the math and learning science books I might want, but I felt like some extra perspectives and guides concerning experimental design, casual inference, and statistics might come in handy. I know I can't expect to read any of these cover-to-cover in the course of the next week, but if nothing else the examples and explanations they contain could be valuable. Having books around is a luxury, but for this level of work, it's even more important to have a way of keeping track of the hundreds of journal articles that I might want to use in my comps responses. I've been using Mendeley as my reference manager since the spring of 2010. Regardless of what tool you use -- Zotero, RefWorks, Endnote, Papers, etc. -- it's important during any writing period to have something that allows you to focus on writing, not scrambling for citation information and digging through the APA style book. One of the best investments I've made as a grad student has been my diligent attention to the annotation, curation, and metadata accuracy of my Mendeley library. 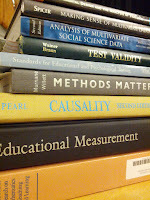 I was somewhat lax about it during my master's year and my first year of the PhD program, but then I spent most of two weeks of a summer going back through every PDF, every book, every syllabus, and every paper I wrote to make sure I had everything neatly cataloged. And I haven't relaxed since. Right now I have 890 references in my personal library, with others in group collections, and I can find or cite any of them in just seconds. If there's one thing I can't let myself do is turn my comps into a massive search for new literature. I admit, I love the thrill of the hunt, and I've spent many hours digging around in Google Scholar tracking down papers that I realistically have no time to read. I need to trust that most of what I need I already have and I've already read, and keep my literature hunting to a minimum. For my last week before comps, I actually spent very little time studying and more time minimizing potential distractions. I've been to the grocery store, I've washed dishes and laundry, and I reformatted and reinstalled my operating system, virtual machine, and software on my computer because a few things had gotten flaky after a year of hard use. I've never liked studying right before a test anyway, as any attempt to "cram" is nullified by thoughts that always begin, "If I don't know it by now...." I passed my 100-hour studying mark a week or so ago and that will have to be good enough. I'll probably work mostly at my desktop. If your computer had three monitors, 16 GB of RAM, university broadband peaking at nearly 90Mbps up and down, and a pair of Sennheiser HD 595s, you'd probably work at it, too. I might try working some in my office, and my kitchen table is nice for when a lot of open books are involved. I don't want to be stuck in my office chair for 18 hours a day, so I plan to do some heavy thinking while running and in a pinch I can even prop my laptop up on my exercise bike. Obviously, yet unfortunately, once I get my questions I'm pretty limited in what I can say about them. I'm not to receive outside help, solicited or unsolicited, and even after the exam is over I'm only to talk about the process in general terms. (I'm assuming that's in the event my committee members want to reuse the same or similar questions in the future.) Assuming I'm not exhausted by the process, I'll try to summarize my approach and workflow, lessons learned, and hopefully some epiphanies that come in the process of working through my questions. I'm looking forward to the week of writing and then readying myself for the oral defense, scheduled for November 27th.